South Carolina: Animis Opibusque Parati / Dum Spiro Spero. This isn't the actual South Carolina welcome sign. 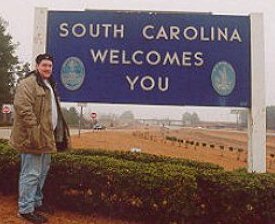 I crossed into South Carolina at three different points: I-20 across from Augusta, Georgia, on I-95 at the North Carolina line, and right on the local streets at South of the Border. The two Interstate signs were both dangerously inaccessible (I-20's is on a bridge and I-95's on an overpass), and there was no welcome sign at South of the Border (unless you count South of the Border as one huge welcome sign). This picture was taken at the Welcome Center on I-95, about three miles south of the North Carolina line. There was an identical sign on I-20 at the Georgia line. The camera is facing north. I was in the Palmetto State on the final day of my Dallas road trip; and two miles in Georgia notwithstanding, it was the beginning of the most grueling day of driving I've yet experienced (eight states, 847 miles, 16 hours). And to top it off, a cold, windy drizzle was hanging overhead all morning. I had lunch at the aforementioned South of the Border. I had seen it mentioned in the sadly out-of-print American Quest by Jack Barth, though I never read that chapter all the way through. I had once found a Barbecue Pringle's container filled with about 150 South of the Border arcade prize tokens (though I didn't have it with me here). I actually forgot about it until I got on I-95 and started seeing the billboards. South of the Border has billboards for 200 miles in either direction on I-95. I was only on I-95 for about 30 miles from where I-20 ended to the North Carolina line. In that span I estimate I saw between 35 and 50 billboards for SotB. For those who do not hold a Ph.D. in applied mathematics, that works out to more than once every mile, and the closer you get, the more frequent the signs become. It's kind of hard to describe SotB. It's basically a little town with a Frito Bandito flavor to it. The mascot for this whole thing is a sombreroed Mexican named Pedro. There are restaurants, a miniature golf course (titled, of course, "The Golf of Mexico"), motels, and arcades. The centerpiece of the town is a massive fireworks outlet, Fort Pedro. Fireworks are illegal in North Carolina, so all the Tar Heels come south of the border during Fourth of July weekend to stock up on Class A Explosives. Then they go off into the woods, consume potent potables, and detonate said explosives. SotB was rather deserted whilst I was there. I guess a quarter to noon on a Thursday in December isn't their busy season. I ate lunch at one of the diners there. When they seat you they give you this card containing a list of major cities and how far they are from SotB. When I returned I told my friend Chris that I stopped in Dillon, as he had mentioned it once before. "Oh, you got suckered in too?" My very indirect return trip from Dallas enabled me to visit the three most (in)famous state capitols from the 2000 Presidential Campaign: Austin, Texas; Tallahassee, Florida; and Columbia, South Carolina. Yep, how quickly we forget. For some unknown reason the South Carolina Statehouse became an issue during the primaries because of the Confederate flag that flew from atop the dome. Sen. McCain and Vice President Gore wanted to take it down, and Gov. Bush said it was up to the people of South Carolina to decide that. Of course, Gore and the media jumped all over Gov. Bush, but no one ever asked anything of the Governor of South Carolina who continued to fly it, or of the senior Senator from South Carolina, Ernest "Fritz" Hollings, who, while Governor, issued the 1962 order to fly it in the first place. And no one ever said anything about Tennessee's flag (one of the three stars stands for the white race), Arkansas' flag (stars represent the stars on the Confederate flag) or how the birthday of the first Grand Wizard of the Ku Klux Klan, Nathan Bedford Forrest, is a state holiday in Arkansas. Anyway, after Jesse Jackson et al. became involved, and the NAACP urged a tourism boycott and the New York Knicks refused to hold their usual preseason training camp in Charleston, South Carolinians finally reached an agreement. 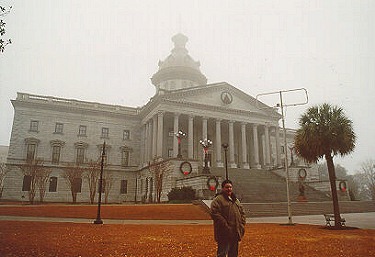 The Confederate flag was removed from atop the Capitol, and was placed in the plaza to the right of where I'm standing. It's surrounded by a two-foot high iron fence. The more Southern capitols I visited on this trip, the more irritated I became about how what was essentially treason against the United States was officially celebrated by all of these state governments. Some people, even 135 years later, have not gotten over Appomattox Court House. They still refer to it as "The War of Northern Aggression." One of my favorite columnists, Dr. Walter E. Williams, once pointed out why it should be referred to as "The War Between the States," as technically it was not a civil war (a civil war is one in which two factions are fighting over one government; this was a failed independence movement). Okay, I'm starting to get off-topic. There is a statue of President Washington on the steps of the Statehouse (it's under the wreath between the palm tree and that antenna-looking object). The plaque on the pedestal says that the bottom half of the walking stick was broken off by General William Tecumseh Sherman and his troops when they sacked Columbia on February 17, 1865. The dome is a little different-looking. I know how in my taste the dome of the U.S. Capitol is the standard, but I don't think this dome works on top of a building this size and one with such a clear sightline that is not blocked by trees. I think a dome like this would look better on a smaller building, like in North Carolina, Delaware, or New Hampshire. I think, especially from this angle, that a more traditional-looking dome would make for a more striking presence. The capitol grounds in Columbia take up about four city blocks. I was very impressed with the grounds, certainly well above average. What do I think makes for good grounds? I would say a lot of room, landscaping (lawns, trees, gardens), a "park" atmosphere, statues, historical markers, and an impressive capitol. This page loaded in 2.256 milliseconds.